The typical starting system wiring diagrams can divide into non-relay control type, single starter relay control type, and security starter relay control type. The specific circuit needs to be respectively learned referring to different typical control circuits. The main function of car starting circuit is using the small current from the car battery to control the large current of the car starting circuit, thus to start the starter motor and power the engine. There are three main components in the switch starting circuit: ignition switch, starter solenoid, starter relay. Usually, the ignition switch connects with a key or a button, and inside of it has the regular wire connects to the car battery. 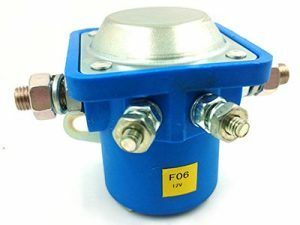 When the ignition switch is turned or pressed the button to start position, there will be a small current flow through the starter solenoid coil, allow sufficient current flow to the starter. Expect to take part in starting control circuit, the ignition switch also has other functions, such as lock the steering wheel, connected to car electrical system, and connected to the vehicle computer fault diagnosis. 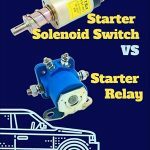 The starter solenoid is the main part of the control starter circuit, including the with relay type and non-relay type. 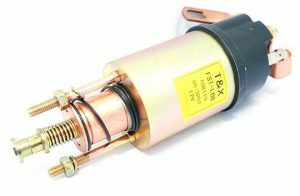 The solenoid switch is composed of a solenoid, which is an electromagnetic device that produces the attraction or retention of the moving core. 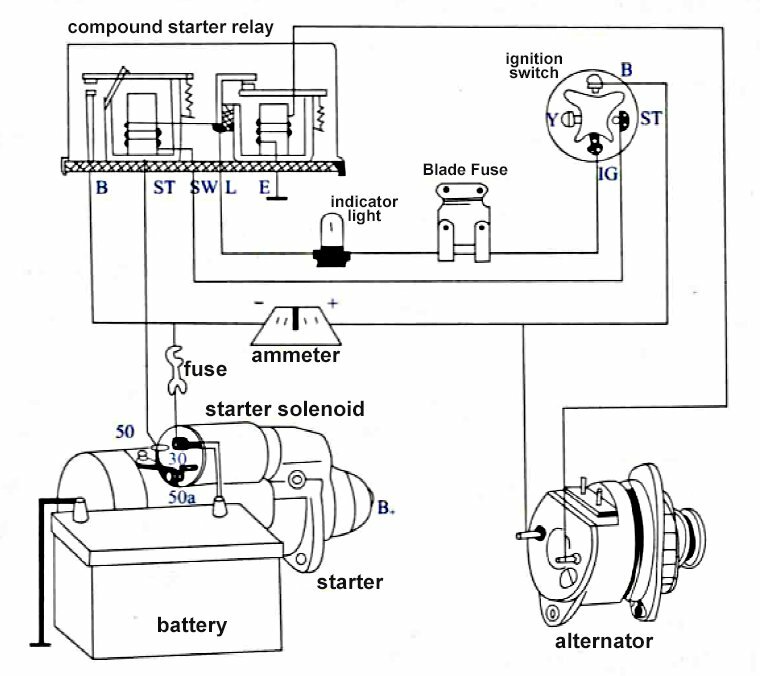 Most of the starter solenoid is fixed directly to the top of the starter. The starter relay is another switch that is used to control the starting circuit. In the start control circuit, the relay is connected in series with the battery to shorten the transmission of the large current cable length. 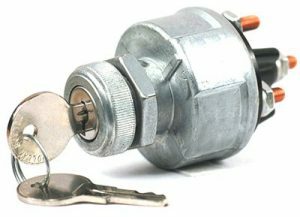 In mini cars equipped with small power starter, the ignition switch (start position) is used to control the starter solenoid switch directly, as shown in the picture below. 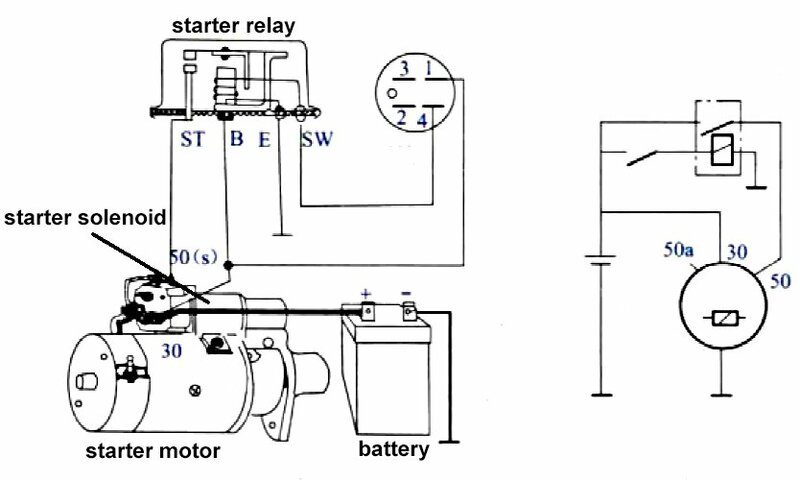 When large power starter is equipped, in order to reduce intensity of the current that passes through the ignition switch and avoid ablation of the switch, the start relay is often used to control the heavy current of the starter solenoid switch, and the ignition switch( Start position) is used to control the low current of the relay coil. The automatic transmission equips with neutral starting switch, which is in series connection to the bonding terminal of the start relay coil. Neutral starting switch is on only in the case that the automatic transmission gear lever is in parking position (P) and neutral position (N). In other gears, the switch is in an off state, so as to avoid damages to machine parts caused by misoperation. To ensure that the starter can stall automatically and the starter circuit not connected after the engine starts, some cars adopt the compound relay circuit with safety driving protection. The security starter relay controlled car starter wiring diagram is as shown in the following picture. Before the engine starts, the alternator does not generate electricity, the voltage of the neutral tap (N) binding post is zero, no current passes through the charge light relay, Starter relay coil and charging indicator relay contacts are connected to ground. When the ignition switch key turned to the Start position(ST), the starter will start. After the engine starts, the neutral tap (N) terminal post of the car alternator outputs proper voltage, which acts on the charge light relay coil and cut-off the current of the starter relay. At this point, even if the ignition switch key not loosened timely, or the key is incorrectly rotated to the ST position again, the starter will not operate.